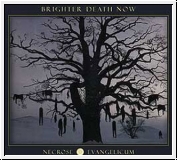 Recorded during 1995 – that most creative of years for Brighter Death Now, which also produced the much harsher album Innerwar, as well as the final part of the epic “Great Death” trilogy – Necrose Evangelicum was immediately received as a new milestone in the genre of “sacred-death-industrial.” In fact, the album had the most favorable reception of any BDN record, and has generally been considered the most easily accessible of BDN’s work. Diesen Artikel haben wir am Sonntag, 01. Mai 2011 in unseren Katalog aufgenommen.